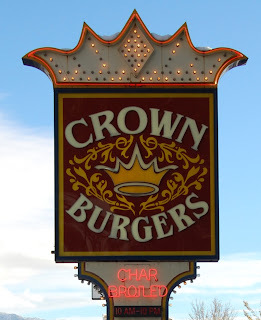 Crown Burgers has been serving up burgers to the folks of Salt Lake since 1978. It's a great family owned and run business. Crown Burgers #1 priority is their customers. Of course, so is quality. Burgers and sandwiches are prepared in the front counter grill. Everything is cooked to order. Crown Burgers has over 100 items on their menu. But they're famous for their “Crown Burger”. It is a quarter pound hamburger patty on a sesame seed bun with thousand island dressing, lettuce, tomato, onions, cheese, and then it's topped with lots of hot pastrami. It is a must for first time customer. It's a pretty big burger. Try the kids version if you must. Crown Burger also has beef burritos, grilled cheese, fish and chips, fried chicken, gyros, onion rings and their own version of a Utah original "fry sauce". Stop in and give them a try.